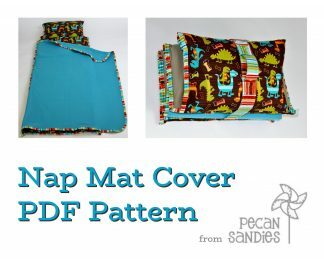 This listing is to be used to add an embroidered name to any nap mat cover purchase. 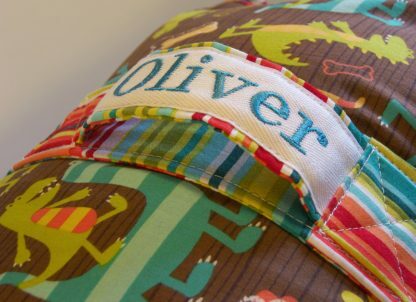 Names are embroidered onto cotton twill tape that will be attached to a cover's handle, or on a corner of the back side of the cover. Please include the name in the Note to Seller field when checking out. You may include a color preference, or an appropriate one will be chosen for you based on the prints used. Covers with off-white tones will be made with off-white twill tape rather than white. 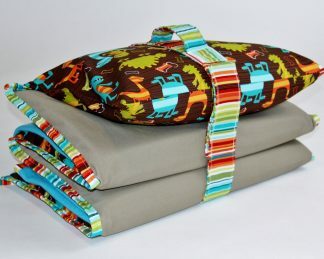 By default, covers with straps will have names attached to the handle, and covers without straps will have them on the corner, but you may add a note if you'd prefer otherwise.